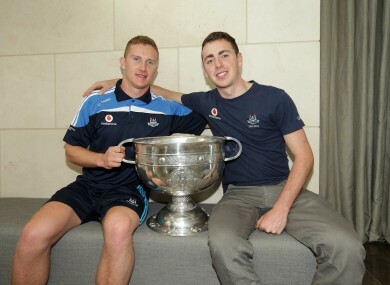 Dublin's Ciaran Kilkenny and Cormac Costello celebrate with the Sam Maguire yesterday. IF CIARAN KILKENNY had stuck on the road less travelled, he might well be taking part in an AFL Grand Final this weekend. Instead, of course, this week he’s celebrating a first All-Ireland SFC title with Dublin in his first year back since his Aussie Rules adventure. Kilkenny’s former footie club Hawthorn take on Fremantle in the showpiece game down under on Saturday but the Castleknock clubman is happy he decided to return to his Gaelic football roots. Kilkenny didn’t last long with the Hawks but would he have made the grade if he stuck it out? Kilkenny was substituted in the second half of the win over the Connacht champions. Was he happy with his performance in his first senior decider? “I thought I worked hard and I just didn’t have the end product at the end of the day I didn’t take my scores and could have fisted one ball over the bar but that’s not what’s important we won the game whether I played brutal or we won by one point or 20 we take the win at the end of the day and that’s been our motto throughout the year if we won by 50 or 1 we just want to win and are delighted we did and am delighted to get my first All-Ireland,” he says. While Kilkenny pocketed a Celtic Cross in his first season with the Dubs’ senior outfit, he was led there by Jim Gavin in his debut year as boss. “He is an unbelievable manager,” says Kilkenny. “He just let’s express ourselves as footballers and he just puts that kind of elite professionalism there for us to express ourselves as footballers. He is a great manager, great understanding for the players as regards study and things like that. Email “Ciaran Kilkenny: I made the right call coming home from Oz”. Feedback on “Ciaran Kilkenny: I made the right call coming home from Oz”.